Many educators have varying viewpoints on how to clean drill. Most instructors teach in the same process they were taught. After being instructed in many groups with various teaching methods, I apply these key aspects and find them to be the most efficient for a clean, crisp end result. Although some of these steps may seem to be "wasting time," remember that doing things correctly is the top priority, and will sometimes take more time than rehearsing in a hastened, more inefficient manner. 1. 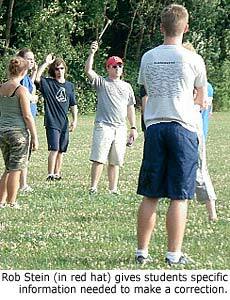 Break down complicated sets into groups of students and rehearse by rotating the groups. Example - There is an ensemble box rotation. Break down the set by assigning group numbers to each line of the box. The most outside line is "group 1," the next line, "group 2," the third line from the inside is "group 3," etc. For the first rep, the only members running the set are those in "group 1." This will benefit the students in numerous ways; the most obvious being that there is more attention to the individual since the staff only has to concentrate on a small percentage of the band. Students will always perform better when they know they are being watched and analyzed. Another benefit of this method is the students will better learn where the key dress points are during the move, allowing them to better understand their path and step-size while simultaneously ingraining the move in their muscle memory. After "group 1" has successfully performed the move a few times in a row, rotate to "group 2." Repeat the process until each line has performed the move successfully. After that, start adding in more groups; this can be done in numerous ways. For example, rehearsing the two most outside lines, then gradually adding from the outside-in, or vice versa. The more time there is for the project and the more ways the move is rehearsed, the better understanding your students will get and the cleaner the overall product will be. Although this step is somewhat time consuming, if implemented correctly, you will notice immediate results and improvement with your band's visual execution. 2. Always make sure the students are starting and ending at their exact written locations. As obvious as this step may seem, I have been involved with many organizations in which the phrase, "we gotta get through these pages" has overpowered the implementation of efficient rehearsal techniques. The common misconception that the act of doing more means the group is "getting better" is completely false; in fact, the more a band rehearses incorrectly, the worse they will get. Rehearsing bad habits only means the students will get better at performing incorrectly. In order to ensure this process, it is imperative for at least all section leaders and staff members to have drill sheets at all times; and of course, every marching member should have their "dot book." 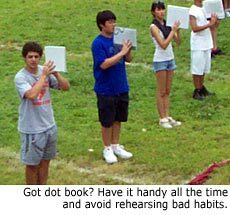 (A "dot book" is a small note pad students keep on their person during rehearsal which contains their exact location for every drill page.) Spray paint can aid in this process significantly; assign section leaders and field staff to paint a small mark on the dot of each member of their section for starting and ending locations. After the dots are painted once, rehearse the band with quick, numerous reps. During the move have the performers dress to the form as directed, and once the rep is finished they look down to see what adjustments, if any, need to be made. This step will greatly increase the student's muscle memory, as will especially make the beginning and ends of sets much clearer. 3. When correcting students, always be sure to give them the information needed to make the desired correction. Another somewhat obvious statement, but many instructors seem to overlook this step in the heat of rehearsal. Consider the phrase, "Brass, you folks really need to improve your spacing. Reset! ", or, "Come on guys, you can do better than that! Reset!" We've all been guilty of saying something similar at one point in our marching education careers, but what information is actually given in those statements? None. Even in the first phrase, the instructor tells the brass to improve their spacing, but there is no information given on how to do so. As experienced educators, we have a tendency to forget what it was like to be a beginner in the marching arts and sometimes take for granted what our students do or do not know. Students will receive higher quality education when they are given the "why's and how's" of the activity. For example, a proper phrase would be, "Brass, you folks really need to improve your spacing. Where is the dress point? Point to it. (Everyone points to the dress point. If they don't know, inform them.) OK, so that's where your eyes should be looking. Make sure each step of the set is equal in size, some of us are getting there too early and taking really small steps at the end. Think about that this next time! Reset!" Empower the students to be their own instructors, share with them the knowledge that you possess; this will greatly increase the performance qualities of the students, and will make the director's job much easier when the members attain this knowledge and become more self-sufficient. Photos and text courtesy of Rob Stein.